This is described as consisting of 127 regular hexagons. 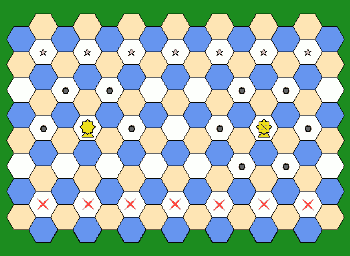 While true the game was initially conceived as a trigonal variant with the original trig board being replaced by an equivalent hex-lattice board. This equivalence is demonstrated by the images on the left. At the top is the trig board; at the bottom is the hex-lattice board. The central image shows the hex-lattice overlaying the trigons, the white hexes representing the points where six trigons might meet. The starting position of the pieces on the hex-lattice board is shown on the right. Guard - the Yeomen and Captains. The King and the Army Pieces move using the coloured hexes (equivalent to the trigons on the trig board). 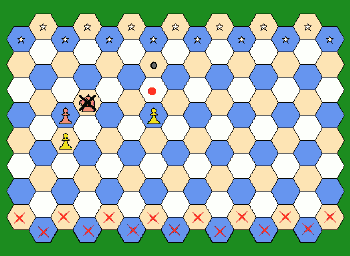 The Guard Pieces are resticted to the white hexes (equivalent to the points on the trig board). For the King and Army pieces, the white hexes do not exist unless occupied by an enemy guard (Yeoman or Captain). When so occupied movement in that direction is blocked. The piece values given in the following table are only rough guestimates. On the images legal moves are indicated by grey dots. Moves 1 step in any direction. Can move as either War-Horse or Battle-Hound. Slides in any orthogonal direction. May continue movement until blocked by friendly piece or enemy guard, or until captuing an enemy piece. It cannot leap. Steps 1 or leaps 2 in any orthogonal direction. Leaps 2 : initially 1 orthogonal, followed by 1 diagonal. Steps 1 directly forwards without capturing. Captures by stepping 1 diagonally forwards. Yeomen step 1 diagonally forward or sideways. Captains may also move diagonally backwards.